Aaliyah is one of the 350 Syrian refugees WHO is training as home-care staff to serve older and disabled Syrians in Turkey. Each day, Aaliyah* wakes up to a dark sky in her home near the Mediterranean city of Mersin, in southern Turkey. Before leaving the house to catch the first bus of the day, she checks on her sister Lilah*, bedridden since a bomb hit the family house in the Syrian city of Homs. The explosion caused burns all over her body as the roof fell over her head. She is now unable to walk, move her hands or even talk. As the high expenditures for her sister’s treatment began to pile up, Aaliyah heard from some acquaintances that Mersin’s Refugee Health Training Centre was seeking applicants for its new home-care programme. Through this programme, WHO supports Turkey’s Ministry of Health in its aim to provide care to older and disabled Syrian refugees in their homes. With the support of the German Federal Government, WHO has trained 350 Syrian refugees like Aaliyah to serve as community health support staff for the provision of home care and social services to those Syrian refugees who experience difficulties in reaching health centres. Once certified, Aaliyah and other caregivers can be employed under the supervision of Syrian doctors and nurses serving in 7 Refugee Health Training Centres across the country. In coordination with staff at the WHO-supported Centres, they will pay regular visits to Syrian patients in their homes to ensure their well-being. Conflict-related injuries, the long-term disruption of Syria’s health system and the poor or insufficient management of chronic conditions have meant that large numbers of people with disabilities have effectively been left behind – or left without proper care. In Turkey, WHO supports the Ministry of Health in reaching out to this vulnerable group and ensuring they are not forgotten. Responding to the needs of each patient, WHO-trained Syrian home-care staff will help to guarantee safe environments to avoid accidents at home, promote patients’ self-care and balanced nutrition, support follow-up on treatments, and ensure proper care of those who are bedridden to prevent complications. 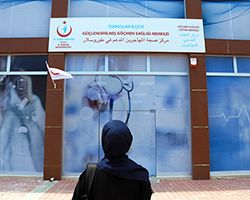 The process of certification, which Turkey’s Ministry of Health will conduct with support from WHO, will be based on performance during the training as well as a personal interview with national authorities. Those who are certified will be able to work within the Turkish health system and receive a stable salary, leading to a clearer future in their new home. World Refugee Day offers an annual opportunity to commemorate the strength, courage and perseverance of millions of refugees – including the more than 3 million Syrian refugees living in Turkey. The WHO European Region as a whole, and particularly countries closest to North Africa and the Middle East, have faced large influxes of migrants and refugees in recent years, which has led to significant health challenges. WHO/Europe works closely with Member States to strengthen the health sector’s preparedness and public health capacity to better address emergency-related migration and to find ways to better meet the health needs of refugees in Europe. * Name has been changed upon interviewee’s request.